On July 14 the UN Office on Drugs and Crime (UNODC) released (PDF) its 2016 estimate of coca cultivation in Colombia (the dark blue line). It shows a lower estimate than the U.S. government’s (the green line), but a sharper rate of increase over 2015. Increased expectations of receiving compensation for substituting coca within the framework of the peace accord. 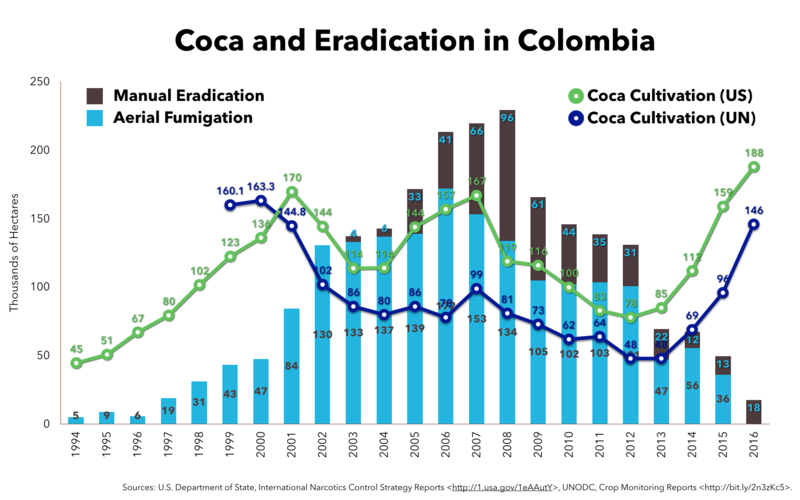 In an interview with Colombia’s daily El Tiempo, UNODC’s representative in Colombia, Bo Mathiasen, made clear that renewing aerial herbicide spraying—the preferred strategy of many in the U.S. government—is not the solution. It’s a sovereign issue for Colombia. But the past impact of glyphosate [the herbicide that is sprayed] could be analyzed. Did it really work for anything and give the desired results? I don’t believe so. In the medium term, there was always replanting in these zones. Spraying happened, and they planted again. The desired change was not achieved.